I Have Been There, or Have I? 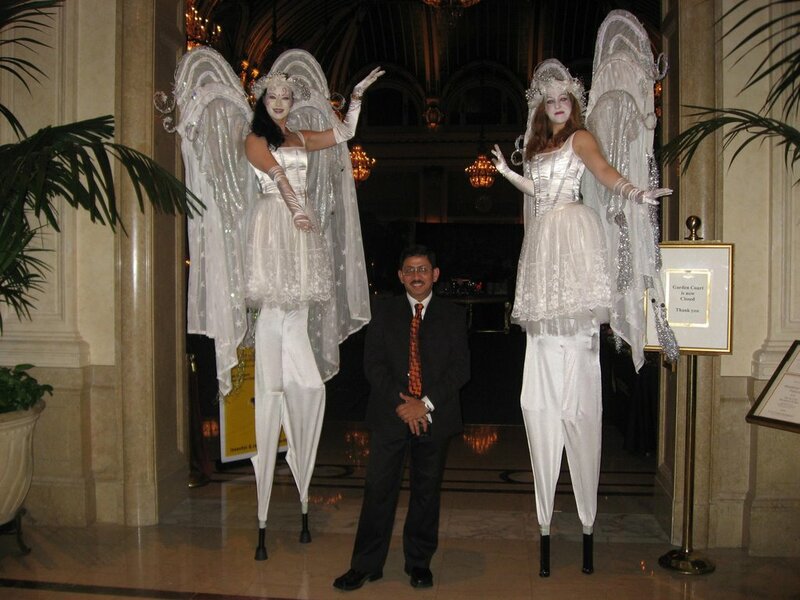 I am back in San Francisco, this time for a couple of dinner events. The first one, yesterday, was a cocktail cruise on a luxury yatch. 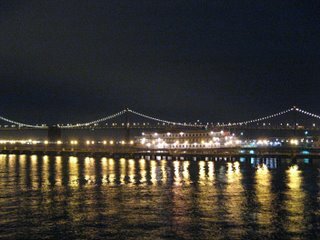 The San Francisco Spirit has three decks and an air-conditioned interior, which was good because the temperature had dropped considerably. 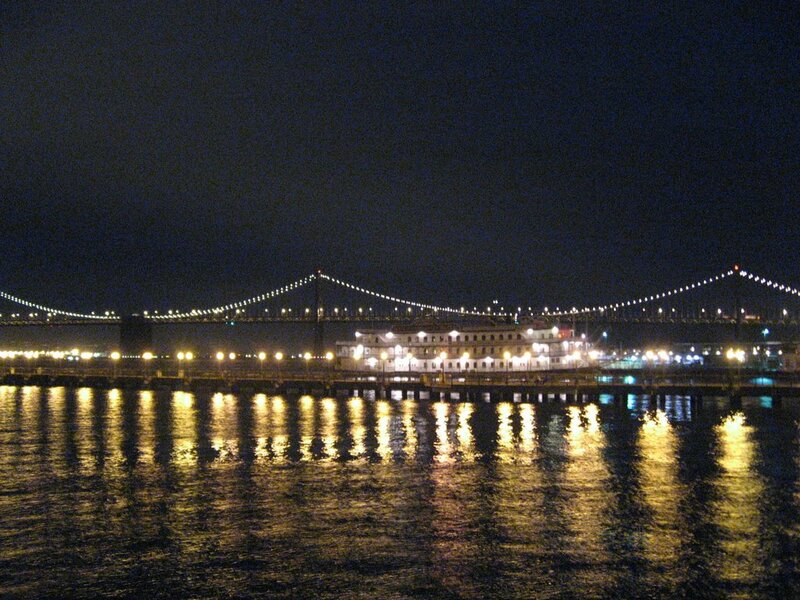 We tasted wine and nibbled on hors d'oeuvres, as we cruised in the San Francisco bay taking in stunning views of the city's skyline, the Golden Gate and Alcatraz at night-time (picture below). The Palace Hotel where I am staying has a long history; it is one of the oldest hotels in San Francisco, and it's old-world charm remains intact. The wide corridors, the ornate ceilings, and winding staircases are a welcome change from the other hotels. 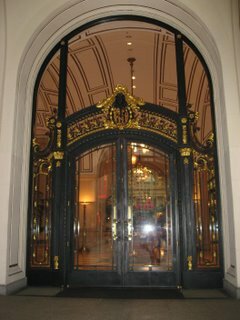 The picture here is of one of the ornate main doors to the hotel. The majestic Garden Court banquet area in the lobby level was earlier the Grand Court which served as an entry area for horse-driven carriages. The hotel is also home to The Pied Piper, an Olde English style martini lounge that has been serving drinks since 1875. 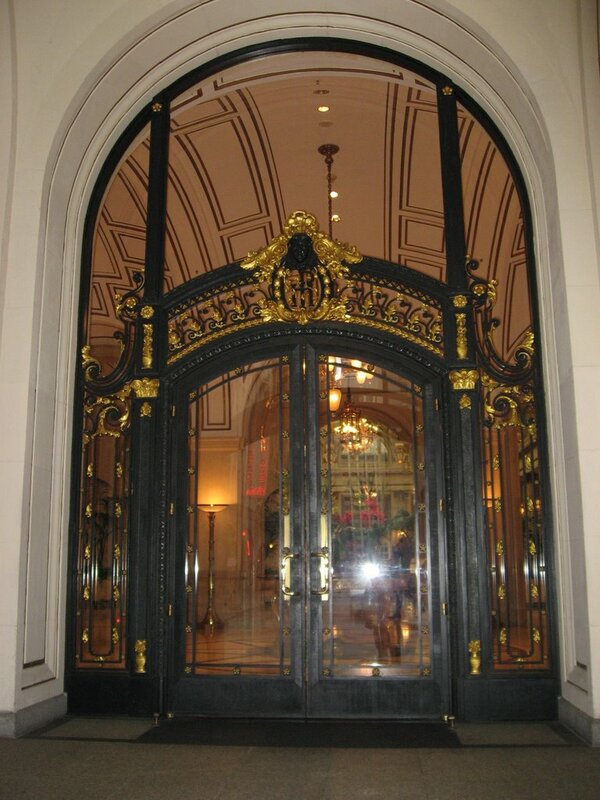 I had lunch at Maxfield's Grill, within the Palace Hotel. Lunch consisted of North Atlantic Salmon topped with a spinach pudding and garnished with baby carrots, followed by a sinful delight called Cookie-baked Alaska with Raspberry Ice-Cream. I also visited a museum with a group of colleagues: the California Academy of Sciences & the Steinhart Aquarium, which is is one of the ten largest natural history museums in the world. The museum is undergoing major renovation until 2008 when it will reopen in a new and impressive building. Until then, the dinosaur section and the aquarium are open and housed near the Moscone Center in downtown SFO.